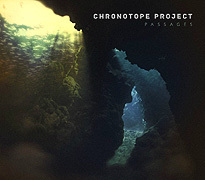 Passages (49'43") by Chronotope Project opens as would a storm blowing in from paradise. Jeffrey Ericson Allen's drifting approach - warm in tone, and pleasantly melody-led - gives this music a welcome and distinctively uncommon atmosphere. With clarity and attention he articulates five tracks worth of spacey, hazy realizations of a live electronic load - yet warmed by the dependable pleasures of this musician's soothing leads and consonant harmonic content. Moments of sinuous sonic curves wind lazily, then speed onto more linear routes. Overlapping planes of burnished chords build, as large aural forms rumble through the sound field. Soft sequencer patterns roll with an ever-brightening pulse, while sustained, steady notes calm and console. From chronicles of desolation, and still chill zones, to vigorous workouts of charged musical intrigue, Passages places the monumental right next to the incidental. Its ashen landscapes and moonlit fields, and then a fleeting moment of light at dusk, are meant to hold, then lighten the spirit. Chronotope Project thinks of the listener as a sensory register, and asks softly for our active engagement with his creation - so that these two solitudes may at last touch.